First published poem from 1968. ( in 'Dawn' ) I was taken aback by some of the prescient imagery. Chopped the last two lines from the original. Superfluous. Made one or two small changes. Pic. 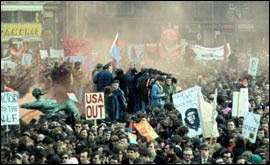 Anti-Vietnam War demonstration, US Embassy, Grosvenor Square. The time and place of my political birth!